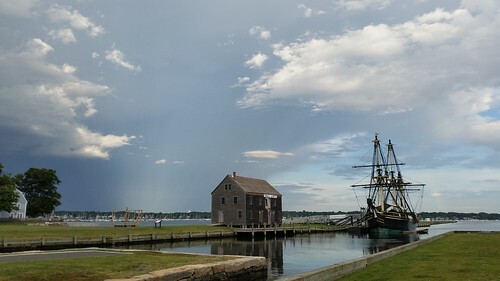 The tall ship, Friendship in Salem with some funky sky colors on the precipice of a thunderstorm. I caught this last night while walking home from dinner. There was just a perfect mixture of color in the sky--so many different shades of blue and gray. Throw into it the mid-ground of a classic sailing ship, boating house and harbor and it looks like something that should be painted. A sky like this is likely to reveal all sorts of excellent visuals--especially after the storm passed but the clouds stayed with the sun peeping through occasionally. I had a lot of pictures to select from including a few rainbow photos but I still really liked this one. Even the grass in the forefront provides a welcoming approach to the sky beyond. Also to note, for those that might noticed. I decided to approach this Photo Reflection a Day differently for the rest of the year. Up until now, the rule was that I would have to write about a photo I took on that day. So I would have had to take this photo today (Saturday). But the reality is that many times, many of my best photos get shot but because of evening obligations or just when it is that I have the time to write has passed, means I miss sharing the photo out. So I've changed the rule to the day before so I can more consistently share photos.